This dahlia is very slowly opening. I wish I could tell you what kind it is, but I honestly don't know. It could be one that I got on clearance last year, or it could be some bulbs I picked up in late spring. Either way, I'm happy it has made an appearance! The dahlias in the front yard fall over once the blossoms open. Any tips on that? I don't want to have to stake them all, and I wonder if maybe they don't get enough sun and are leggy. 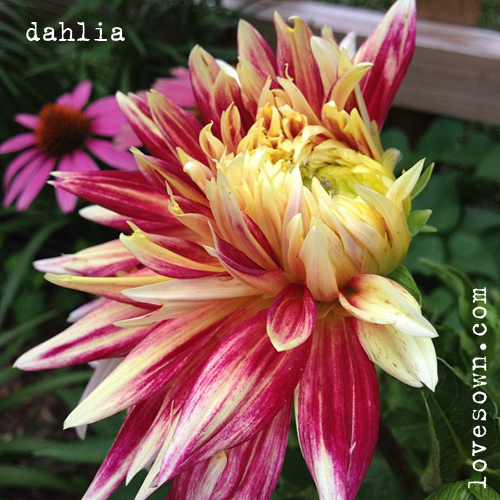 That is one gorgeous dahlia. I stake mine with old tomato cages that I clip off all but the lower ring. The ring is hidden by the foliage and the dahlias stand tall.